Yoko Nakagawa is a certified professional life coach, who specializes in helping those who work in high-tech and startup environments, particularly those in product development and engineering roles. 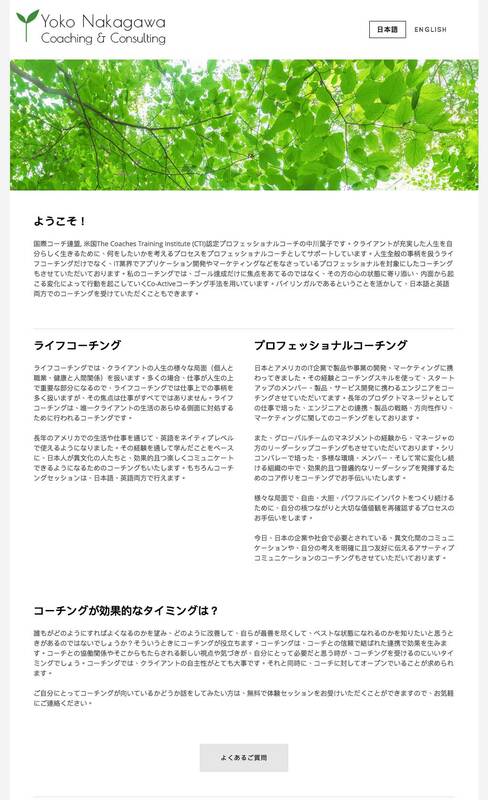 Yoko wanted an easy-to-maintain, easy-to-update, bilingual (Japanese and English) website to showcase her coaching & consulting business. Since Yoko did not want to spend too much time worrying about the nitty-gritty details of her website (hosting, updating, security, etc. ), ZapTuba recommended that she consider a web-hosting service with an integrated website builder and management tools, such as Squarespace and Weebly. After test-driving multiple services, Yoko chose Weebly for their confirmed double-byte support and easy-to-use website management tools. ZapTuba took it from there: setting up Yoko’s website on Weebly, choosing a base theme and then customizing the theme, catering to Yoko’s tastes and needs. Yoko was also looking for a simple, modern logo to represent her business online and in print. To highlight Yoko’s biculturalism, ZapTuba wanted to design a logo that incorporated both the meaning of Yoko’s name in Japanese and the representation of her name in English. In Japanese, the name Yoko consists of 2 Kanji characters – 葉子. ZapTuba combined the meaning of 葉 (leaf) and Yoko’s first initial, to design a clean, graphic logo.